Babies change far too quickly, so documenting their first milestones is a fantastic way to remember and treasure those precious moments. Keeping a record of their first tooth, that magical first word and their stumbling first steps can also be pretty fun to do. The question is, how should you document them? 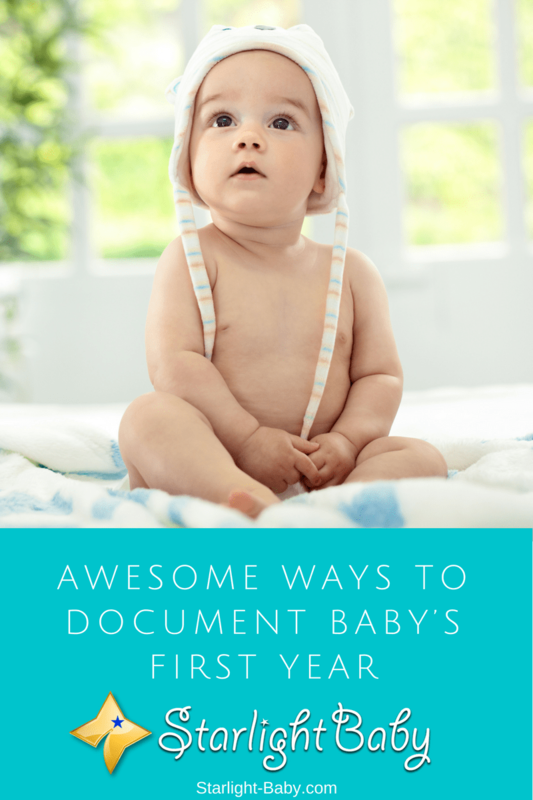 There’s a lot of options open to new parents when it comes to documenting baby’s first year. If you’re looking for something a little more unique, below you’ll discover some awesome ways to document baby’s first year. As babies change so quickly, taking plenty of photos is a great way to document your little one’s first year. Taking comparison photos gives you a unique look into just how much your baby does change, even in just a matter of weeks. You can choose to have baby pictured with their favorite toy each month. Or, take a picture each week or month of you holding baby. That way, you’re in the photo too and they’ll have a collection of beautiful memories they can look back on when they’re older. Comparison photos are easy to do, and they provide lifelong memories you can treasure. If you’d rather just document baby’s first milestones, a memory jar is an excellent idea. Each time you notice your baby doing something new, write it down on a piece of paper. Add the milestone and date then fold it up and place it into the jar. You can then empty the jar at the end of the year, or in years to come, and remind yourself how far your little one has come. You could also jot down a little note to your baby alongside each milestone, which they can read when they get older. This is a unique, sentimental idea which could even be used for each year of your child’s life. If you want to go a step further, why not create your own memory box? Rather than just placing little notes to record each milestone, you can fill the box with anything you want to remember from baby’s first year. You could add the first strand of their hair, photos, clothing your baby outgrows and even hospital mementos. You can either cerate the box yourself if you’re into arts and crafts, or you can buy one. In years to come, you and your child can take the box out and go through all of the precious memories you saved. A 1st year poster is a creative and fun way to document baby’s first year. You can actually find pre-made posters online which enable you to just fill in the blank spaces. However, if you’re good with a computer, or you’re pretty skilled in arts and crafts, you can always choose to make one yourself. It can be used to document the most important milestones from the 1st year and it doubles up as a personalized piece of artwork too. Stick it on baby’s wall and use it as a poster. They’ll enjoy being able to see their personal milestones as they grow up. Similar to a poster, an infographic is the most modern way to document baby’s first year. This would need to be created on a computer, so you will need some basic IT skills. It’s basically a lot like a poster, only it uses more visuals to record the most important milestones. Customize it with your baby’s name, date of birth and then decide which milestones you want to record. If you aren’t confident in your creative ability, the good news is there are some fantastic sample templates available on sites such as Etsy. You could even add how many photos you’ve taken of your little one and add their photo to the infographic to fully customize it. Another modern way to record baby’s first milestones is to use an app. You can find lots of different apps you can download on your tablet or smartphone device. They basically do all of the hard work for you – all you need to do is fill in the details and the app will store it for you. The Ovia Baby Development Tracker is one of the most popular milestone recording apps currently available. Not only does it let you record milestones, it also lets you share them with loved ones. The app also provides expert advice and links to over 1000 different parenting and child development articles. You’ll find a lot of different apps available so take your time to compare them and see which one you prefer. Creating an annual report for your little one can be a really fun way to document their first year. It’s a step up from the poster idea, helping you to track your baby’s progress each month. It’s basically a calendar where you can write down memorable things which happened that day, add photos, record baby’s mood and even your own mood on any given day. Don’t feel confident in your ability to make one? You can purchase ready-made annual report calendars which you can simply fill in. Your baby is going to grow at an alarming rate. This means, you’re going to have a lot of outfits your little one has outgrown throughout the year. While giving them away to friends, family or colleagues is a noble gesture, why not keep some and create a baby clothes quilt? You can combine all of your little one’s favorite outfits and create a quilt they (or you!) can keep forever. This is an especially great idea for those who love to knit and sew. Our final idea is going to be tough, but totally worth it! There’s a growing trend of parents taking part in 365-day projects to develop a comprehensive record of baby’s first year. There’s numerous ways you can do this depending upon how much time you have to dedicate it and how creative you are. The most basic idea is to take a photo of baby every single day and then compile the photos into a large collage at the end of the year. If you want to take this idea up a notch, you can use the photos to create a time-lapse video. You can teach yourself how to do this online, and it really does provide a beautiful platform to treasure your little one’s first year. You could even take a video each day, rather than a photo, then edit them all together at the end of the year. These are just some of the awesome ways to document baby’s first year. Whichever method you choose, you’ll be able to look back on all of the important milestones you might otherwise forget. They can be treasured by you and your child for many years to come. How did you choose to document your baby’s first year? Share your stories below! I have to admit that this is one of my life history that I miss so much. I could recall in the past that I always wanted to see some pictures of my kid life while mom told me that there is only a birthday picture which was unfair to me. So, I believe that it is an interesting part of human life. I can feel you bro! When I was a baby a only has a few pictures and I don’t even have my first birthday picture or a video it is really sad. I want to know right now if how fun is my birthday is and who are the people that are invited. I will ask my mom to tell me about how is it going in my first birthday in this world. I would have wanted the same, but it would have been better to have pictures of growing up for nothing compares with that. That’s the reason I said that I won’t allow my kids pass through such situation of not having their kids moments recorded and captured. That is why I say kids these days are so fortunate because the technology we have now makes it easy to take lots of pictures and videos that they can look back to when they’re older. We should do our best to keep the pictures/videos so they can have something to look back to. Their future kids would surely be happy to see their parents’ kiddie pics, too. It was the year 2002 when I gave birth to my first baby. I remember I was using a camera with film. Almost every month I took pictures of him. From his first head-up up to his first walk. Every first moment of his life as a toddler I take a picture. Like for example his first long-distance travel, the first restaurant where he eats, first haircut and a lot more. Now he is 15 years old and when he saw his baby pictures he always laughs and amazed especially his foot and hand prints. That really sounds awesome, BelindaMT. It’s wonderful that you were able to document his growing up years. I was also able to do that with my boys and we always laugh when we see their photos as kids, especially the funny shots. It’s also a good throwback Thursdays pic on FB, haha. I can say that your son is very lucky and definitely he is happy with it he really appreciate it. Not every one has a remembrance in their first year in this world, just like me, there is some of people who is asking if there is anyone who have a picture in their first year, and most of them at unlucky for having nothing but stories of their first year in this world. ( no pictures or even videos) But still we should be thankful because God let us live in this world. Always still be thankful. This blog will be very helpful for every parents. Because we all know that as a parents we want to see document our baby’s growing stage level by level, especially the baby’s first year of existing in this world, we want to document it so in the future we can show it to them how happy he or she in his first birthday. Now a days it is now much easier to document a baby’s first year, because we have now a high technologies that we can use to document. Before it is hard to document a baby’s first year because camera is too expensive. But now anyone can do it. You got that right, Dictator20. It’s really easy to document all of baby’s growing up stage now because gadgets are more affordable unlike before when cameras are expensive, plus you need to get your film rolls developed which is time-consuming. Now, just click away and upload them to a file and that’s it. You get it right ma’am Elsa. It is also what my mom answer to me when I ask her what she don’t take a lot of pictures in my first year of existing in this world and she answered me that film was too expensive before, aside from that before you can see what inside that film you have to take it to the nearest camera or printing store for your film to be developed too hassle right? And now I promised to my self that I will document my son or daughter’s first year in this world in the future. so someday there is something that I can show to them. Yes, that is truly a wonderful idea. I’m sure your child will be thrilled to see all of the memories you have stored for him/her. I have always wondered why my parents didn’t have any photos of me when I was young. (They just had negatives.) Thank you for your post. I now have a son of my own and vow to capture valuable memories to share with him one day. Thank you for all your great tips. Yes, It is sad to think that they weren’t able to document our first year of existing in this world but we have to understand that it is so hassle to document before. So lets document our child first year in this world just like how much we wish that they documented our first year too. Let us still be thankful for the technology it makes everything possible. This blog will be useful for every parent, especially for new parents who want to document their baby while growing, thanks to the tips you share with people you do not know personally. Parenting becomes easier for new parents because of the tips you share, I also enjoy reading your blog. I also enjoy reading your blog because I have learned a lot. I am actually looking on how can I document the first year of my little angel. She will turn one this month and I think this article helps me a lot. I need to have some memorandums about her first life and I will start it today. Just like what I said before, Documenting is now very easy. If you want your little angel to have his first year so memorable and if you want him or her to see what happened to her first year is that, you can pay for a photographer so your little angel will have a well formal documented in hes or her first year. But if you don’t want because honestly hiring a photographer was pretty expensive so here is a way to do it on your own. You can take a video and a picture of your angels first word that he or she is speak, its first walk, in short you should documents all of his ‘first’. And after one year you can all compile it and you can make it a video presentation if you want. Hi! French. I hope you were able to get a lot of memorable photos during your daughter’s first birthday 🙂 Keep taking photos and videos. I am sure she will love to see them when she gets older. Wow if this article was made years ago I could have made a fantastic milestones records of my 2 daughters. But I think it is not totally late to do it even though they are already older. It will make them cherish those wonderful ideas you have given us. I think I will try and create all of those ideas you have given us. It will be a perfect gift for their upcoming birthday. Thanks very much for making us realize that we have missed doing something like this but all is not late since I have a record and I will just compile and create their milestone history record. I’m sure you still have time to take snapshots and videos of your daughters’ growing up years, and when they turn 18, you’ll have enough to make a video presentation for their guests to see. Sometimes, I call babies little wonders because immediately they are born, before you know what’s happening they are growing too fast beyond your imagination especially if you are a traveling parent who comes back to the family once in a while. The best way to help you keep track of how your baby is growing and keeping memories that you missed is through making of documentary on the first year and subsequent years that follows. This would help such parent with savouring every moment they missed with the baby as a result of being away on work by looking through these documentations. I think that creating of a baby clothes quilt would make you feel every moment inches of growth that they pass through. Aren’t they all? They grow up so fast. Sometimes you wish they will be kids forever – adorable and sweet. Have your wife document their growing up years so you’ll have something to see or watch when you come home from your trips. I often do this when my husband is away, and I send him the videos or photos online. We also documented our baby’s growth using our mobile phones. We have lots of pictures from the day we confirmed her mom was pregnant up until the day he had his first birthday. Until now we are still taking pictures and videos and we have this secret group in a social media where we store those pics and vids. Though a bit oldschool, I and my wife are planning to create a photo album with pictures of our son growing up. I would say whenever we look back at those pictures, it really brings us in tears not of sadness but joy because we realize that our has grown up already, we are getting old and our son will have his own family in the future and that’s what life is all about. Seeing our kids grow up or all grown up really makes most parents emotional. I would say it’s pure happiness. It’s really a different feeling. I could totally relate to what you experience. And you’re very lucky to have been able to document everything from the very beginning. Your child is will be happy. Imagine being able to watch how you came to be and how much you are loved. That is priceless. I have stayed with so many relatives in the past, I had to watch them birth their children and also take care of them, most of them are grown ups now they don’t even remember no more that I helped with getting rid of their Pampers. One thing I learnt from this relatives of mine is how they documented their baby’s first year, it was all crazy I will try recalling most of it. One of my aunty kept a sacred camera in her wardrobe, anytime a new thing pops up with the baby she would take pictures of it, she was more like a photographer to her child lol. There was also another of my aunty who kept separate boxes for all her kids, one day I bobbed into her opening it, it had her child’s placenta, milk tooth’s and so much about the child’s year. She told me she was keeping memories of how her kids grow, I didn’t understand back then I guess I do now, I will keep documentaries like the way they did when it gets to my turn. What seriously great ideas! I kept a baby book for my each of my brood. I wish I had thought of or had been able to find some of these amazing ideas back then! Unfortunately, the Internet as we know it was still a few years off back then, and sadly we lost all of our belongings in an unfortunate accident about 5 years ago that left me without anything. So, restarting hasn’t been easy, but we’ve found some fun, creative ways to make more memories and the memory box is one we still use. I really think it’s something that my (not thought of yet, hopefully!?!) grandchildren will enjoy sorting through in their adolescent years. I always thought a memory box, like a shadow box would be a neat idea to put together the first years memories. I don’t know, it’s worth a try! Sorry to hear about you losing every memorable items several years ago. It is truly sad to lose all those wonderful growing up memories. Anyway, I know you will always have the good times in your heart and mind, and it would be heartwarming to talk about them with your kids once in a while 🙂 And great to hear you’re filling up a memory box again.